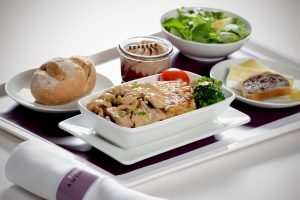 Swiss International Air Lines (SWISS) is further expanding its SWISS Choice product: the airline now offers its Economy Class travellers a range of à la carte meals on its long-haul flights from Switzerland. So in addition to the existing range of inflight meals, the customer can now choose from various exclusive alternatives, which can be ordered in advance for a fee. SWISS is further expanding its SWISS Choice product for its inflight guests. Travellers in Economy Class on long-haul flights from Switzerland can now pre-order an à la carte lunch or dinner. The new choices extend to six different meals, each of which has been specially selected to meet established customer wishes and tastes. The new à la carte options comprise Zürcher Kalbsgeschnetzeltes (traditional Zurich-style sliced veal in a creamy sauce), a “Swiss Brunch”, a platter of Swiss cold cuts and cheeses, a light dining option, a gourmet selection and a Japanese meal. The prices for these vary between CHF 29 and 49. The customer can also opt for a half-bottle of Californian Chardonnay or Italian Sangiovese to accompany their meal. The new à la carte meals are intended not to replace SWISS’s regular Economy Class food and drinks but to offer supplementary individual options to the customers concerned. A limited number of such à la carte meals will be available per flight. 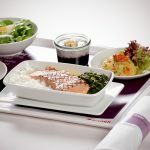 The new meals can be ordered now at swiss.com/swisschoice for any long-haul flight from Switzerland carrying a SWISS flight number, operated by SWISS and departing on or after 7 September. All such meals must be ordered in advance, 24 hours at the latest before departure. The new à la carte Economy Class meal option is not available on SWISS services to Cairo, Tel Aviv or Shanghai. Swiss International Air Lines (SWISS) is Switzerland’s national airline, serving 102 destinations in 46 countries from Zurich and Geneva and carrying more than 16 million passengers a year with its 94-aircraft fleet. The company’s Swiss WorldCargo division provides a comprehensive range of airport-to-airport airfreight services for high-value and care-intensive consignments to some 130 destinations in over 80 countries. As “The Airline of Switzerland”, SWISS embodies the country’s traditional values, and is committed to delivering the highest product and service quality. With its workforce of 8,564 personnel, SWISS generated total operating income of CHF 5 billion in 2015. SWISS is part of the Lufthansa Group, and is also a member of Star Alliance, the world’s biggest airline grouping.